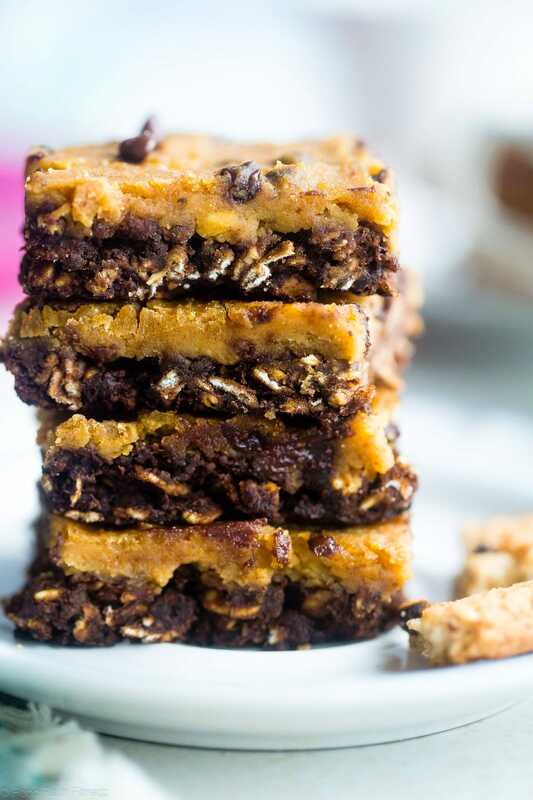 These Vegan Cookie Dough Oatmeal Breakfast Bars are perfect for an healthy grab and go breakfast. Plus they taste like cookie dough! 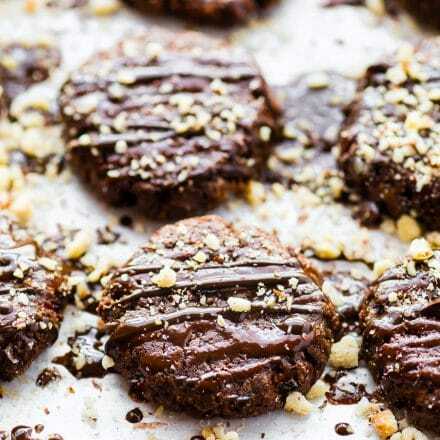 Packed with real food plant based protein, chocolate chips, and gluten free oats. 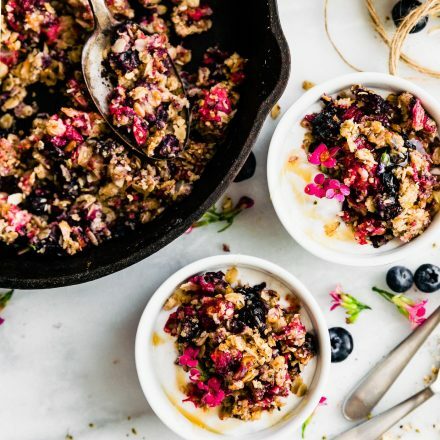 Yes, it’s dessert for breakfast. 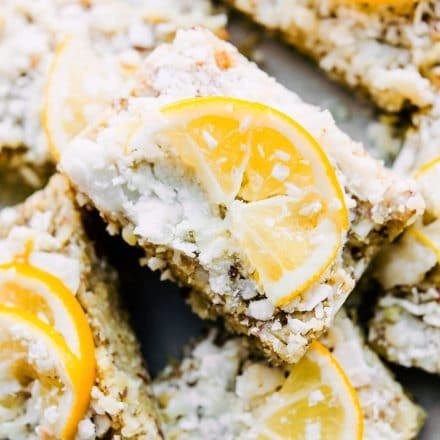 My name is Taylor and I blog over at foodfaithfitness.com! I’m SUPER excited to be guest posting here on the FABULOUS “Cotter Crunch” while my BFF Lindsay is up to here eyeballs in moving boxes. I’ve moved about 29432 times in the past 3 years, so I know how NOT SO FUN moving is. Which is why we are counteracting that NOTSOFUN-ness with a recipe that is jam-packed and totally LOADED with fun. I mean. Cookie dough for breakfast? HOW CAN THAT BE NOT A GOOD TIME? True life confession time though: I really only made a recipe for cookie dough because I am not-at-all-secretly obsessed with it. 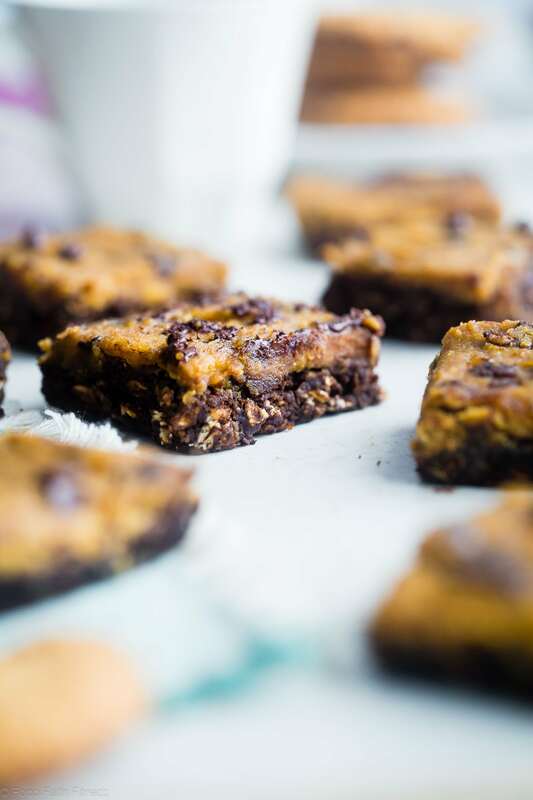 I’ve shoved it into your hungry mouth’s in the form of a cookie dough ice cream recipe, vegan brownies stuffed with peanut butter cookie dough, cookie dough overnight oats and even a cookie dough almond butter recipe. But I think that might be a just a LITTLE too limiting. I don’t think of any of your hungry bellies would continue rumbling if I served a steaming hot plate of cookie dough mango chicken with coconut cauliflower rice. 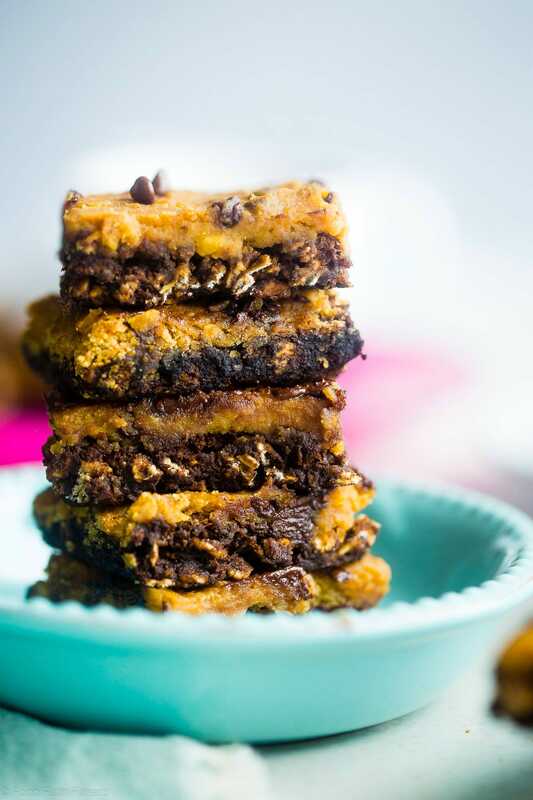 Because I am “THAT GIRL” who gets totally addicted to foods and eats them every single day forever, I also obsess over oatmeal breakfast bars: pumpkin oatmeal breakfast bars in the slow cooker or cacao peanut oatmeal breakfast bars with banana, don’t care what kind. Just want to stuff them in my HANGRY morning-person mouth STAT. You get it. I know this is your life too. I can feel it. 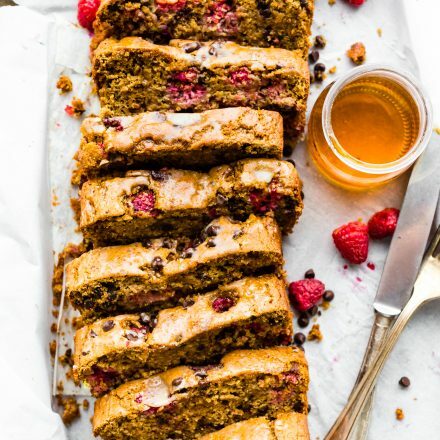 It was obviously only a matter of time before – BOOM – the 2 magical things that I <3 <3 <3 would be smushed together in what can only be called the most perfect of food marriages, and the ULTIMATE way to make yourself roll of out bed. I’ve said it before, and I’ll say it again: will wake up for dessert. X-CEPT “dessert” is actually secretly healthy, vegan-friendly, gluten free and boasting a HEAVY hit of real food goodness. With a HUGE scoop of yumminess RIGHT ON TOP. SRSLY. Breakfast Nirvana. It has arrived and it’s pulling up a seat at your table. Whether you share your coffee is up to you. I’m voting no on that because #SharingProblems and #CoffeeAddicted. In other news, do you not love how chickpeas make the most gloriously creamy cookie dough without the need for flours, butters or generally any not-so-good-for-you ingredients? Plus, THE PROTEIN BOOST. Whoever said you can’t grow big muscles and eat your cookie dough too had it SRSLY wrong. But what is NOT wrong, is the choice to mow down on approximately 6 soft, chewy, cinnamony-sweet squares of breakfast B-L-I-S-S tomorrow morning. Okay okay, I’ll get to the recipe. Ready to make some dessert for breakfast? Yessssss! 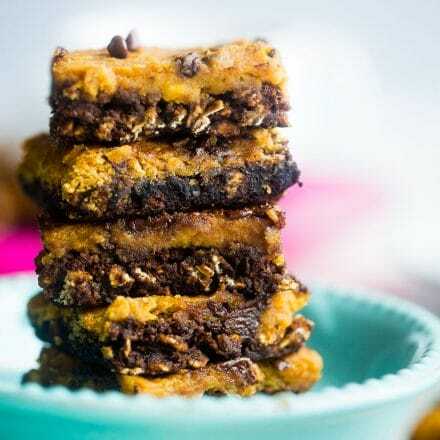 Vegan Cookie Dough Oatmeal Bars to the rescue! 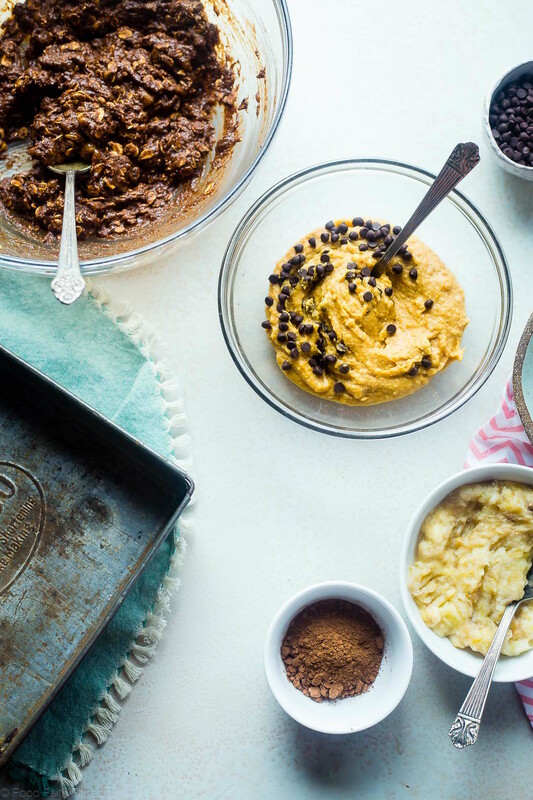 And if you want to double up on the cookie dough factor, add in this edible cookie dough recipe by Veggie Balance! Preheat your oven to 350 degrees and rub an 8×8 inch pan with coconut oil. In a large bowl, using an electric hand mixer, beat together the banana, coconut sugar and apple cider vinegar and until well mixed. Add in the oats, powdered peanut butter, oat flour, cocoa, baking soda and salt and stir until well mixed. Spread the mixture evenly into the bottom of the pan and set aside. Add in all the remaining ingredients, up to the chocolate chips, and blend until smooth and creamy. You’ll need to stop and scrape down the sides every so often. Transfer to a small bowl and stir in the chocolate chips. Gently spread the cookie dough evenly on top of the oatmeal base until it’s fully covered. Sprinkle with extra chocolate chips, if desired. Bake until the edges are lightly golden brown, begin to pull away from the sides and a tooth pick inserted in the center comes out clean, about 17-18 minutes. * Indicates Measurement is for chickpeas after removing the skin. So who’s all up for cookie dough for breakfast? YES! 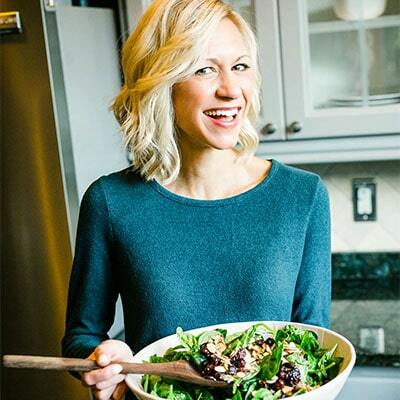 STAY IN TOUCH WITH TAYLOR AT FOOD FAITH FITNESS! TWITTER, FACEBOOK, INSTAGRAM, AND PINTEREST! Thank you Taylor for being a true support system for me. And sharing your amazingly delicious recipes! Friends, I hope you get a chance to check out Food Faith Fitness, Taylor is quite talented in the kitchen and with her photography! You will be hooked! I’ll be back Monday. Well, hopefully. Haha! 1 more week of traveling, unpacking, and settling into Utah. We’re slow. Can you tell? you don’t have to at all. i give you permission to HOG them. Yup. I will take these for breakfast! Taylor, are you delivering??? only if she delicers to me first, then i drop off to you on the way to Utah. haha cool? I love you so! and these bars are EPIC! cookie dough for breakfast?!?!? YAAAAAS!!!!!!! These are so cool!!! I love when a recipe uses peanut powder… I have a whole bag but there aren’t many recipes out there to help me use it up! yes me too! it’s so versatile! Oh wow, I want these!! haha i am not that good. Taylor did this recipe. It’s her guest post. Praise God for her! TAYLOR!!! 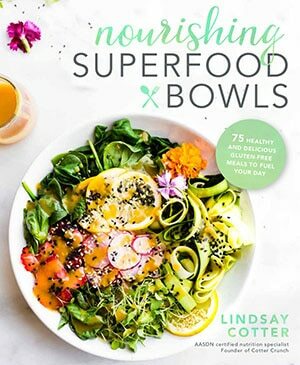 SO happy to see you on Lindsay’s blog! 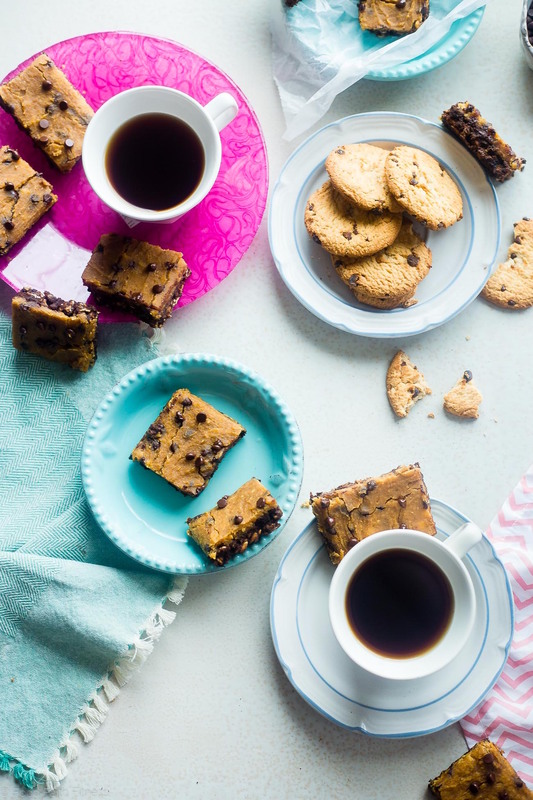 Absolutely in ADORATION of these cookie dough oatmeal breakfast bars. Found these on The Oatmeal Artist and I couldn’t resist looking at it! Fantastic recipe as always!! I think that’s a great plan! yea! let me know what you think. Taylor’s recipe rocks! Any advice in a replacement for the peanut butter powder? These look yummy but we have an allergy in the house. Can we just skip it? Totally understand! Can you have tree nuts? I would try a vanilla pea protein powder if not. Bobs redmill has a really good product! Looks so good, and ive just started to make but confused! You say “In a large bowl, using an electric hand mixer, beat together the banana, coconut sugar and agave and until well mixed.” But the agave is listed as an ingredient for the cookie dough top. Should the ACV be beat with banana and sugar?